Noob question, i'm mining ? Hi, i'm new in mining world. not native english speaker ! I don't know if i'm mining or not. I downloaded the Expanse wallet and followed the steps to create an account and after that i just followed the steps from the DwarfPool asociated with expanse. It's ok ? At this momment i'm mining on a very bad performance machine, it's only for a small period (i'm buying this week a good pc) i want to know if i'm doing it right, i just want to see some results, i'm not waiting for a big result, just to see if it's working and to decide if my pc build will be for mining, thanks very much ! How i know for sure if im mining or not, api from the DwarfPool it's showing statistics only if the worker have 24h from the start period of working. If i'm mining, how much time i need to wait for updating the exp balance from the wallet ?! Thanks again. That's your public key, no need to cross it out. 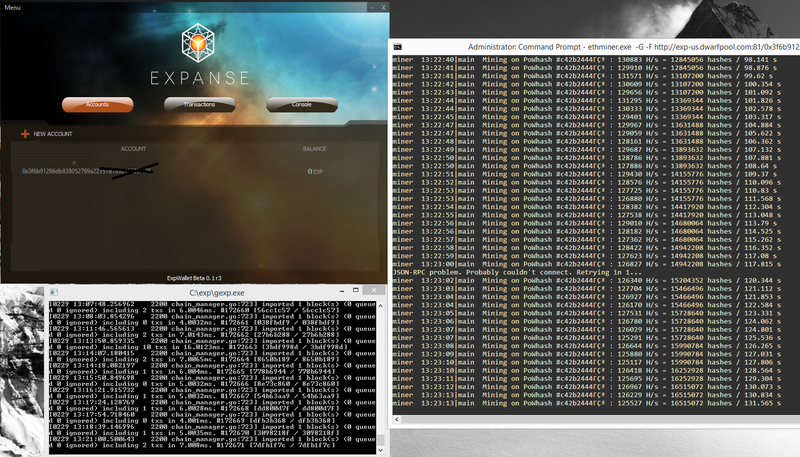 It appears that your ethminer isn't connecting its RPC to Expanse' geth. There you will see all results of your mining. Also you should know that minimal pool balance to withdraw is 1EXP.